This post is an updated version from September 2012. It’s one of our tried and true recipes that we make time and again. We’ve updated the photos and have tweaked the recipe. 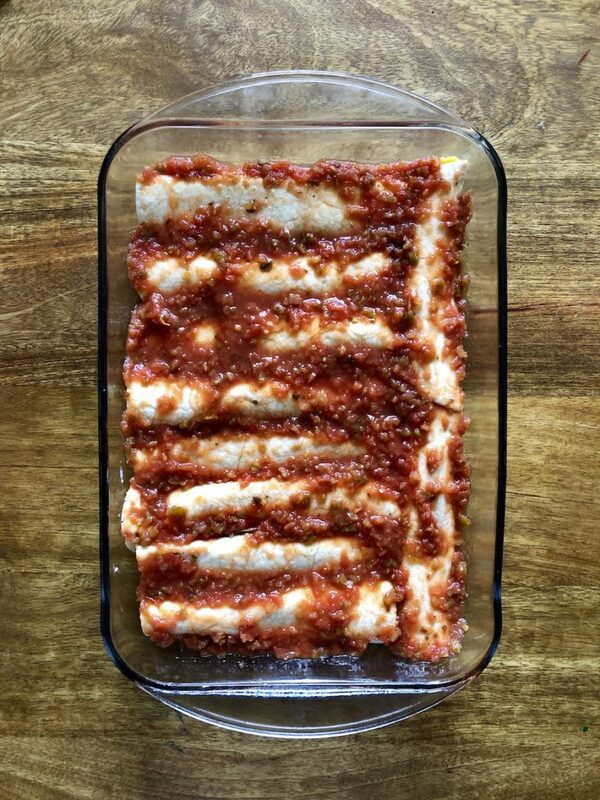 After having made it for years, and having had 3 kids in the interim, we’ve simplified it and have offered strategies around how best to serve this family style. Enjoy! While their deep fried ice cream was a favourite, what I really loved was their take on a grilled cheese. Basically, a corn tortilla, filled to the brim with gooey melty cheese. I was a simple young girl, satisfied by anything smothered in cheese. While Chi-Chi’s may have since closed, my craving for some cheesy Mexican goodness has not faltered. However, I think my tastes may have gotten a bit more sophisticated and I may need a little more than just cheese inside my corn tortillas. Enter our favourite winter vegetable, butternut squash. 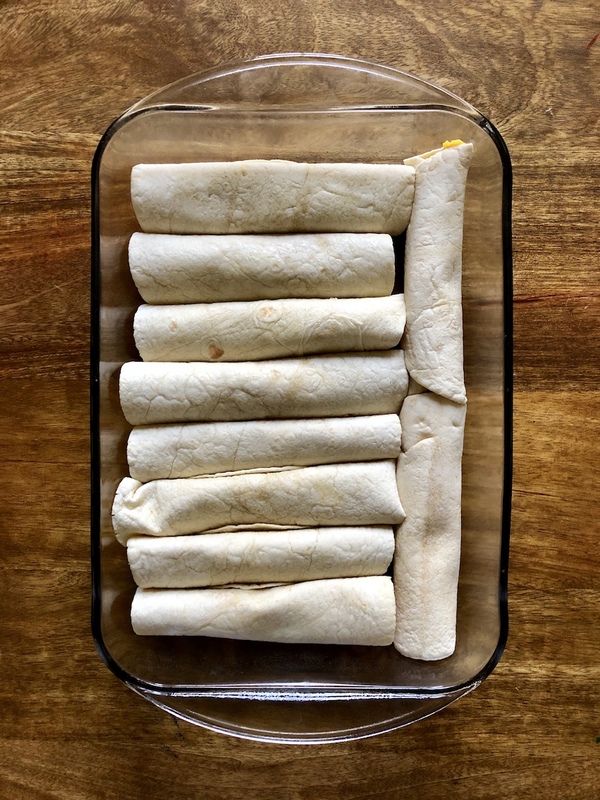 When this baby is roasted whole and the sweet and soft orange flesh is mixed with some flavourful herbs and spices (and of course, cheese) it makes the perfect filling to be wrapped up in a tasty corn tortilla. The best part? There’s no finicky peeling of the squash or cutting and dicing. Simply cut in half, scoop out the seeds, place on a pan, throw it in the oven and you’re done! So you really have no excuses! 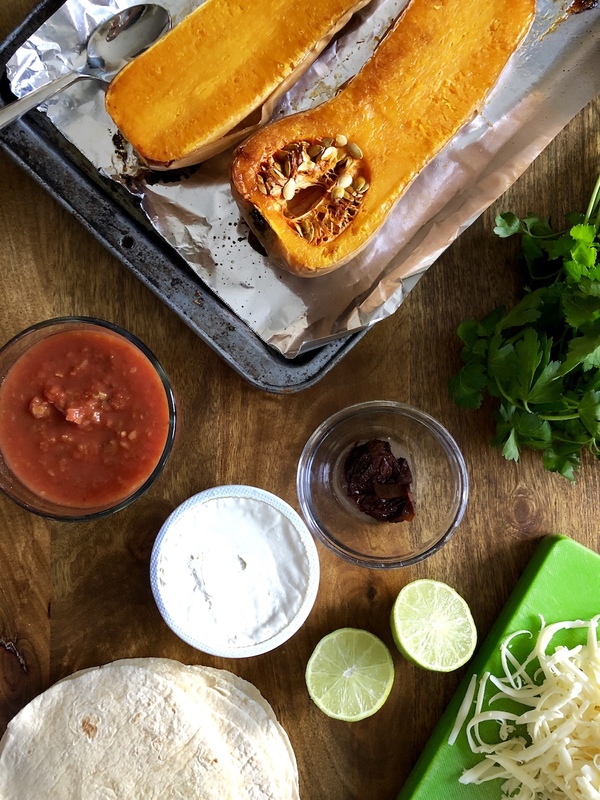 And these b-nut squash-filled babies are also much more nutritious than the plain old cheesy quesadilla…a double bonus! 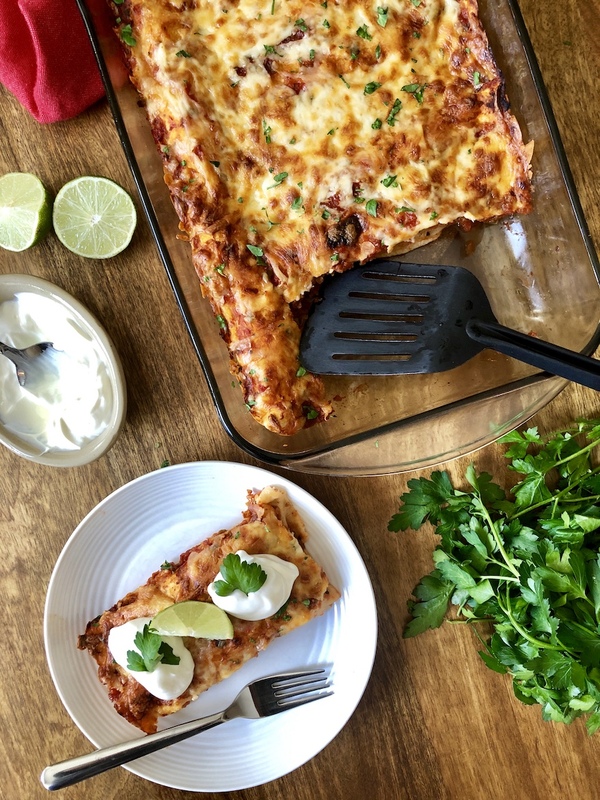 These roasted butternut squash enchiladas will satisfy your cheesy Mexican craving and will also provide you with leftovers that are perfect for dinner or lunch the next day. Also, a great make ahead dish — the entire dish can be prepared a day in advance and simply popped in the oven when you get home from work. The creamy filling is so satisfying that even your most carnivorous friends will love this dish. 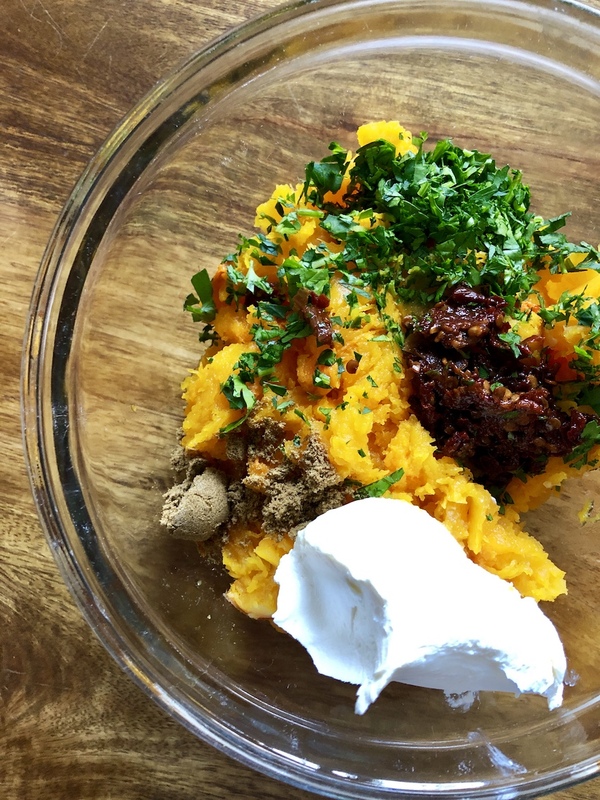 Be considerate to sensitive palates by setting aside a small portion of squash/cream cheese mixture without spice. 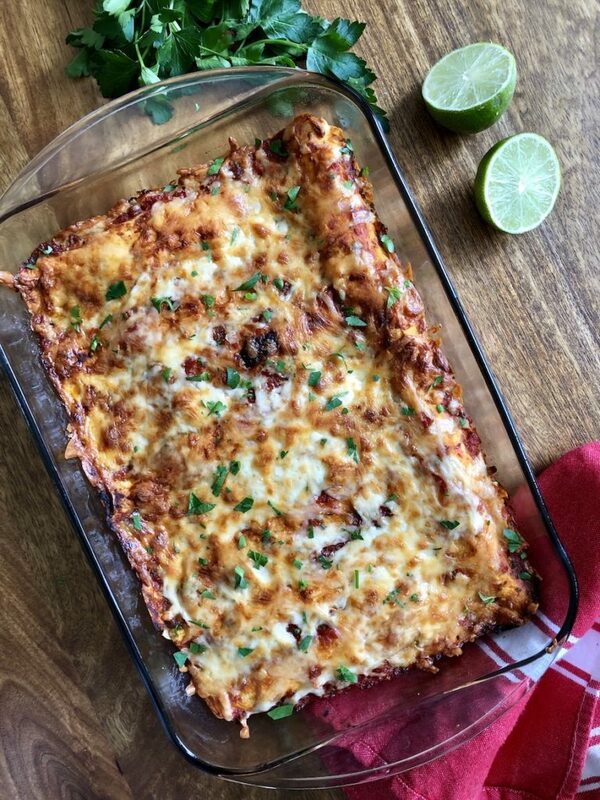 Place these mild tasting enchiladas along the side of the baking dish to distinguish them come serving time. 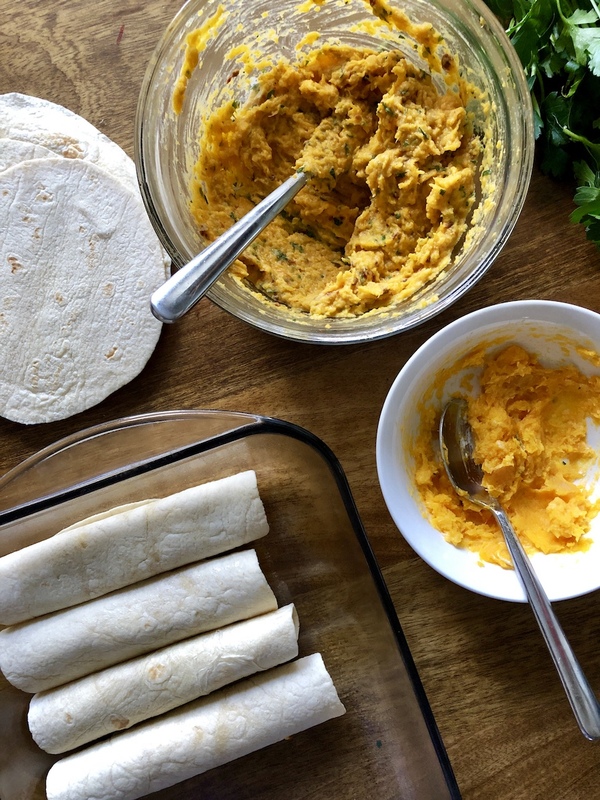 To keep this meal really family friendly, service alongside greek yogurt, plain tortillas, shredded cheese, avocados and salsa so everyone can choose the components they like. 1. Preheat oven to 400F. Brush inside of squash with canola oil and place flesh side down on a parchment lined baking sheet. Roast in oven for about 40 minutes, or until tender. Cool, scoop out seeds and discard and scoop out filling into a large bowl. Discard skins. 2. Mash squash with cream cheese. Add cilantro, green onion, chipotle chili and cumin and mix well to combine. 3. Spoon about 1/3 cup of squash filling into centre of each tortilla. Roll and place tortillas seem side down in a 9x13-inch baking dish that has been sprayed with cooking spray or brushed with oil. 4. Cover tortillas evenly with salsa and top with shredded cheese. 5. 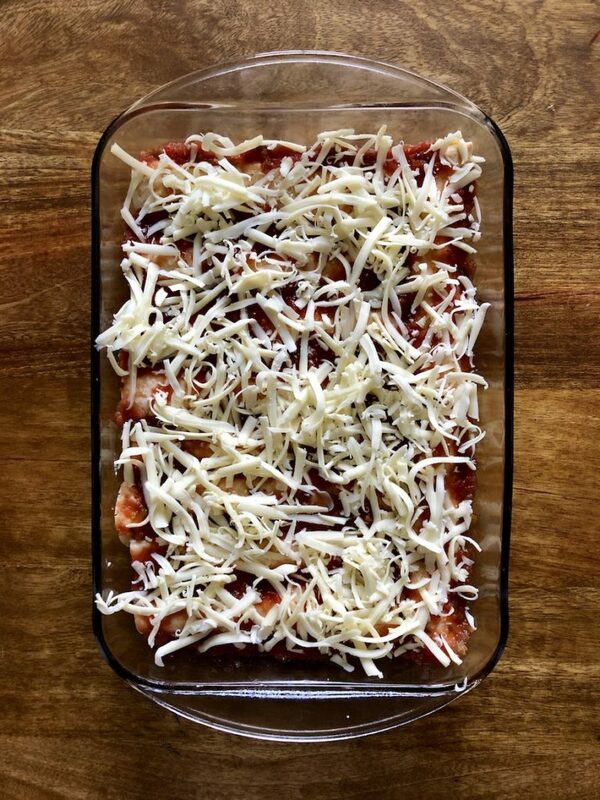 Bake for about 15 minutes or until enchiladas are bubbly and cheese is melted. Broil for an additional 1-2 minutes for a browned top.